Mindfulness is about paying attention to our present moment experiences with openness, curiosity, and a willingness to be with what is. Mindfulness is about paying attention to the present moment with openness to things as they really are, as opposed to how we want them to be or how they could be, or wishing that they were different, which we do quite a bit. Self-compassion is the idea that even with all of our flaws, we can still care about ourselves. I want to talk about the concept of self-compassion. Self-compassion is different than self-esteem. There seems to be this epidemic of self-judgment in the world, where people are often self-critical and have a lot of self-hating voices in their heads. 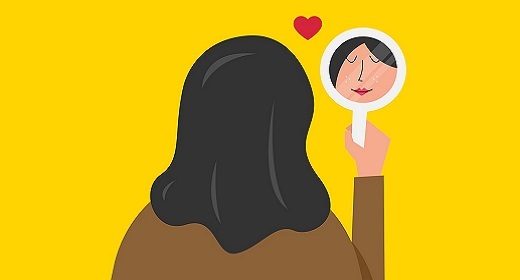 Self-compassion is not the build up of self-esteem, because the build up of self-esteem tends to lead people to needing a lot of external validation to feel ok. Instead, self-compassion is the idea that even with all of our flaws, we can still care about ourselves, that we can make mistakes, that we can screw up, that we can have problems, but we’re still fundamentally a good human being. We can connect with that understanding and have compassion for ourselves, even with the flaws that we have. What’s so amazing about mindfulness practice is we can use mindfulness to be aware when we have those self-critical voices, and we can label that voice as “judging”. We can notice when we have those judging voices because we have a mindfulness practice that allows us to have quite a bit more self-awareness, more ability to regulate emotions, and all of the positive things that come with the mindfulness practice. When these thoughts come we can be on top of them and not get so caught up. I sometimes talk about getting on the train – when you have a really powerful thought and you start thinking about it, and suddenly twenty minutes later you realize you’ve been on this train and were not in the present moment at all. However, the moment you recognize this, you can get off the train. Or, you can recognize this initially and not get on the train in the first place. You can stay at the platform and just let the thoughts go. Find your seat. Let’s begin by settling back into our comfortable posture, with your body upright but not too rigid or tight. Put your feet on the floor, hands resting on your lap, and your eyes can be closed. Most of us do this practice with our eyes closed but you don’t have to. You can keep them open but not looking all around, just looking downward. Begin to notice your breathing. Begin with a few deep breaths letting you relax a little bit more. Invite in the possibility of relaxation with each deep breath. For this next period of time you don’t have all of the worries and concerns, you’ve left them at the door, I hope. They may pop up into your mind but you can remind yourself that you don’t have to get on that train, and just come in to the present moment, feeling, or breath, while being present. Focus on where you feel the breath most. Bring your attention to your stomach and notice if it’s tight or contracted. Take a deep breath if it is and just let it go. Notice your hands softening, and relax them. Notice your shoulders, jaw, throat, and face, and sense everything that’s obvious to you, maybe on the surface of the skin and maybe more internal. Do this with curiosity and with an eye out to relaxing a little bit. Let yourself be here right now, in this moment, and see if you can bring your attention to your breathing and to your breath in your body, wherever you feel your breath the clearest within your body. You might notice your abdomen rising and falling, or your chest rising and falling, expanding, and contracting with the breath. You might notice the tingling at your nostrils as air enters and exits. Some people notice the whole torso breathing with the air moving through their body, and that’s fine too. Shift attention to sounds. Now turn your attention to the sounds around you, just listen to sounds one after the next. Both the sound of silence, and the sounds that come and go. Don’t be lost in a story about the sounds, but just simply listen to them. Find an object to anchor your attention. Find a focus for your meditation today. It could be your breath in your abdomen, or chest, or nose, or the full body breathing, or it could be listening to the sounds—any of those things work fine. Go to whichever one seems the most interesting to you, there’s no right way to do. If you can’t decide then just pick one, it doesn’t matter too much. Notice the body breathing. Notice your abdomen moving up and down, chest expanding and contracting, air moving through your nose with each breath, full body breathing, or the sounds around you. Stay with the sensations of breathing. We begin this mindfulness practice by attending to breath after breath, or sound after sound, staying with it to the best of our abilities, feeling the breath. When the mind wanders, label your thoughts. At a certain point your attention will wander, and thoughts will come into your consciousness. When you notice that you’re lost in a thought, you can say a soft word like “thinking” or “wondering”, and come back to your main focus. Keep doing that again and again. This is emphasized for today’s practice because we are talking about how mindfulness can help us with self-judgment, and recognizing that you can notice the type of thought you’re having and give it a label. You can keep an eye out for judging thoughts, and every time you judge you can say in your mind a soft word like “judging”, or “self-judgment”, or “criticism”, or you can find the word that makes sense to you. It will help you to see the way in which the judgments arise. It’s not personal by the way; you didn’t set out to make yourself feel bad. It just happens. “That person is a better meditator than I am”, or “I’ll never get this right”, or “Why did I do that thing yesterday, it was so stupid”. These are the kind of voices that come into our mind for some of us frequently. For others they may be rare; that’s fine too. Notice self-critical thoughts as they arise. Use mindfulness practice to not judge yourself, to not judge yourself for being judgmental, and just notice judging. If you want to count the occurrences you can; for example “judging 1, judging 2… judging 20.” While you’re noticing these thoughts, you might get drawn to other types of thoughts. If so, you can use other labels like “planning”, “remembering”, “imagining”, and so forth. Invite self-compassion. As you do this practice, please keep a quality of kindness towards yourself. Be curious. Notice how interesting your mind is without judging yourself. Maintain the spirit of kindness and investigation. Did you notice many judging thoughts? I’m hoping you brought a kind attitude to yourself for the judging thoughts, if they were present. Close with kindness. We will do a little bit of kindness meditation to conclude. Notice how you’re feeling, and see if you can also bring to mind someone you love, someone who makes you happy. It could be a dear friend, a child, a pet cat or dog. If you can’t think of anyone, it can be someone you’ve read about who you admire. Repeat kind phrases. Say these phrases, and repeat them in your mind (or you can come up with your own). May you be safe and protected. May you be happy and peaceful. May you be healthy and strong. May you be at ease. Send kind phrases to loved ones. Send these words and heartfelt feeling out to this loved one. Notice how it feels inside to make those wishes for them. Imagine that they send it back to you. May you be safe and protected. May you be happy and peaceful. May you be healthy and strong. May you accept yourself, just as you are. See if you can “take” the kindness. Imagine the kindness moving through your body, wherever you are. Can you bring compassion to yourself exactly where you are, for whatever is happening right now? May I hold this with kindness. May I hold myself with compassion. Take a breath and notice if this is possible, to bring kindness to the best of your abilities wherever you are, however it makes sense to you. May I be with myself exactly as I am. Open your eyes. When you’re ready you can open your eyes, but take your time.